Former US Vice-President Al Gore has urged the world's two biggest emitters of greenhouse gases, the US and China, to work together on climate change. 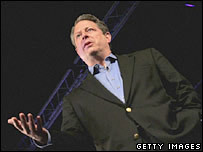 Receiving the Nobel Peace Prize in Oslo, Mr Gore referred to climate change as a "planetary emergency". He said he hoped for a positive outcome from the UN climate talks in Bali. The chairman of Mr Gore's co-laureate, the Intergovernmental Panel on Climate Change, said climate change threatened human security. "Societies have a long record of adapting to the impacts of weather and climate," said Rajendra Pachauri, the Indian engineer who has chaired the IPCC since 2002. "But climate change poses novel risks often outside the range of experience." The IPCC's fourth major assessment of climate science, impacts and economics, released over the course of 2007, forecasts increases in droughts, declining crop yields, and scarcity of fresh water over large areas of the planet. 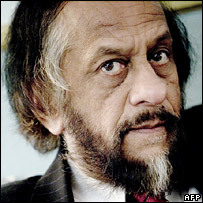 Dr Pachauri paid tribute to the thousands of scientists whose work had contributed to the IPCC assessments, notably its inaugural chairman Bert Bolin, who was unable to attend the ceremony as a result of ill-health. As befits the cinematographic auteur of An Inconvenient Truth, Mr Gore's speech was a rhetorical tour de force. "We, the human race, are confronting a planetary emergency - a threat to the survival of our civilisation that is gathering ominous and destructive potential even as we gather here," he said. "The Earth has a fever, and the fever is rising. The experts have told us it is not a passing affliction that will heal by itself. The former vice-president painted a gloomy picture of the climate impacts that might lie ahead. But he was more upbeat in his assessment that carbon emissions could be tackled. "In every land the truth, once known, has the power to set us free," he said. 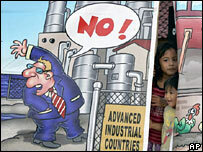 Essential steps, he said, included the universal ratification of the Kyoto Protocol - a reference to the US which is now alone among industrialised countries in its rejection of the 1997 treaty - a moratorium on conventional coal-fired power stations, widespread taxation of carbon, and the mobilisation of entrepreneurial initiative worldwide. His warm words for the efforts that Europe and Japan have made in recent years contrasted with his assessment of "two nations that are now failing to do enough" - China and the US. "Both countries should stop using the others' behaviour as an excuse for stalemate and instead develop an agenda for mutual survival in a shared global environment." Mr Gore and Dr Pachauri now travel to the UN talks in Bali, which have just entered their second week. Delegates there have also heard stern messages about the potential impacts of climate change. On the fringes of the conference, the World Health Organization (WHO) warned that rising temperatures were already taking malaria into regions where it had previously been too cold, such as Bhutan and Nepal. The negotiators' main task is to initiate a process that will result in targets for greenhouse emission reductions when the current Kyoto Protocol targets expire in 2012. A draft text proposes that industrialised countries agree to cut their emissions by 25-40% by 2020. The US is opposed to any notion of binding targets. Dr Pachauri said that hopes remained alive for the Bali meeting, "unlike the sterile outcomes of previous sessions in recent years". The question, he told delegates in Oslo, was whether policymakers would listen to the voice of science and knowledge. "If they do so at Bali and beyond, then all my colleagues in the IPCC and those thousands toiling for the cause of science would feel doubly honoured at the priviledge I am receiving today on their behalf."